Dinner in a flash! 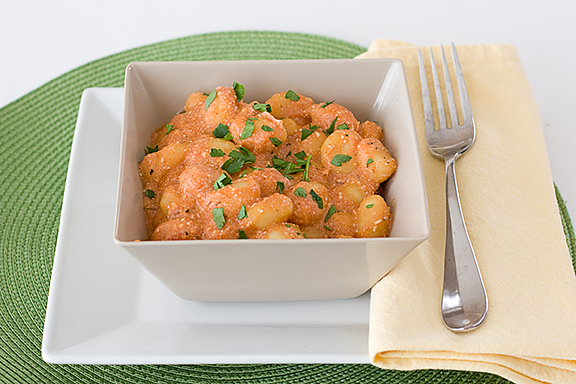 Prepared gnocchi is topped with marinara, ricotta and parmesan in this meatless weeknight dinner. I have been a cookbook addict for years and years now. I started collecting them back before I even really cooked regularly. I even gave myself a challenge several years ago to make sure I cooked and blogged about something from each cookbook that I owned in a year. I (barely) completed it, but I haven’t been as good since then about making sure that I’m actually cooking from my cookbooks. But I’m on a cookbook kick right now. Where I usually hit up the internet for inspiration, I have been pulling my cookbooks off the shelf again. And it kind of feels good. Reminds me of the good ol’ days. 😉 But I think I had forgotten how much I really do enjoy taking a cookbook and sitting on the couch, reading through it, page by page. 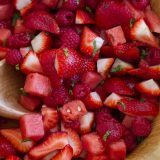 This recipe is one that I found while flipping through one of my cookbooks a little while back. And this recipe is so simple, and so good, that I’ve actually made it a few times since then. The first time I made it, I didn’t have any Parmesan on hand, and it was ok, but I definitely think this recipe needs it. And do you remember the 30-Minute Marinara I shared a little while back? I had made a big batch of that and froze it in 1 cup portions. I just pulled out one of those portions and thawed it out for this recipe. It worked perfectly, was full of flavor, and dinner was on the table in less than 30 minutes. Can’t beat that! Bring a large pot of salted water to a boil. Cook the gnocchi according to package directions. Drain. Place the gnocchi in the bottom of a 2 quart baking dish. Pour the marinara over the top. Dollop the ricotta over the top, then sprinkle with parmesan. Place under the broiler until the cheese is melted and heated through, about 5 minutes. Top with parsley before serving. 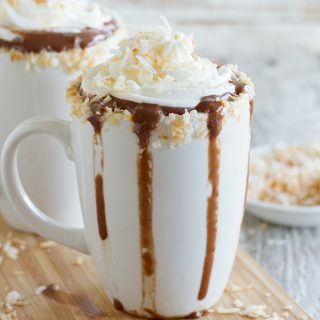 YUMMM this looks amazing! 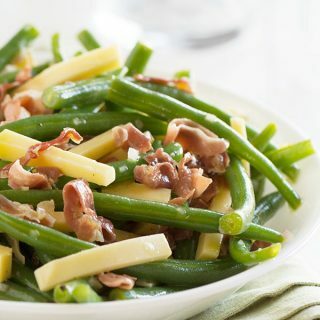 All the best Italian flavours in one dish. 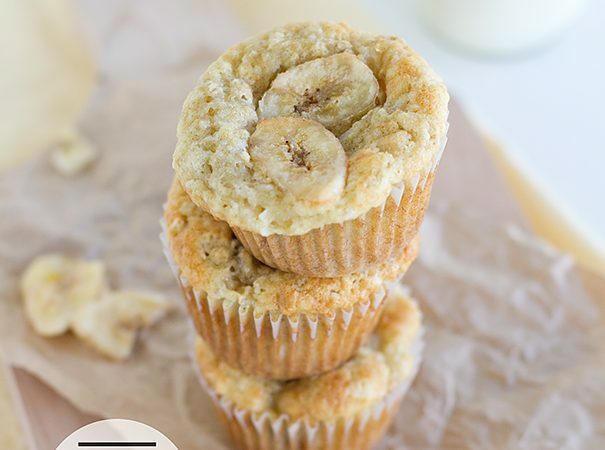 I love how few ingredients it has too – so simple! I love cookbooks too but don’t use them nearly often enough! Of course, it doesn’t help that they’re all packed in boxes at the moment 😀 This dish looks awesome. 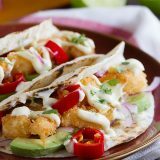 Perfect for an easy weeknight meal the whole fam will love! How easy is this! And SO yummy looking! I have a bag of gnocchi in my freezer, too! Simple but looks great! I cannot deny anything that involves gnocchi. So yummy looking! 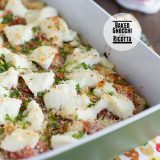 I’ve never tried baking gnocchi! 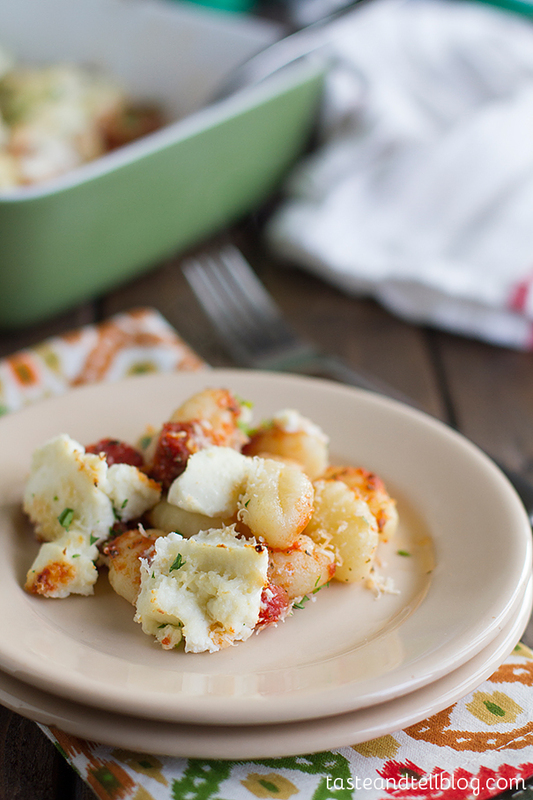 I love gnocchi, what a perfect dinner idea! 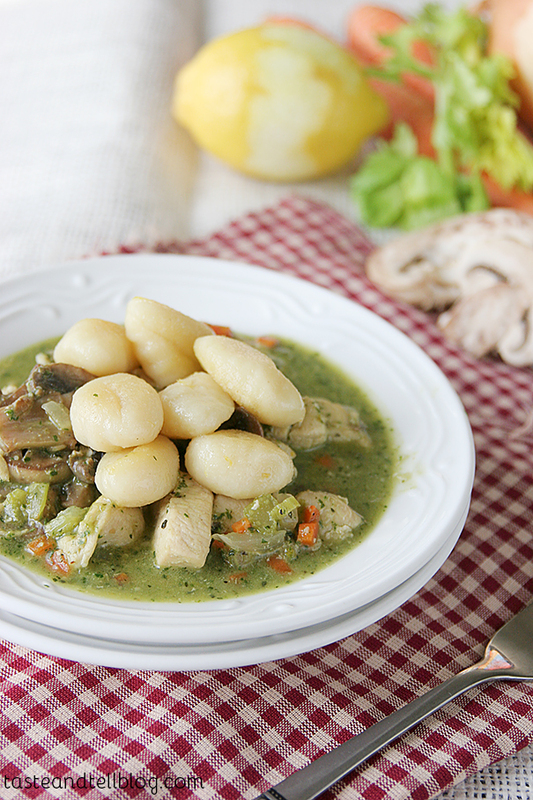 We love gnocchi and this dish looks absolutely delicious. Can’t wait to make it ASAP. Thanks for sharing! 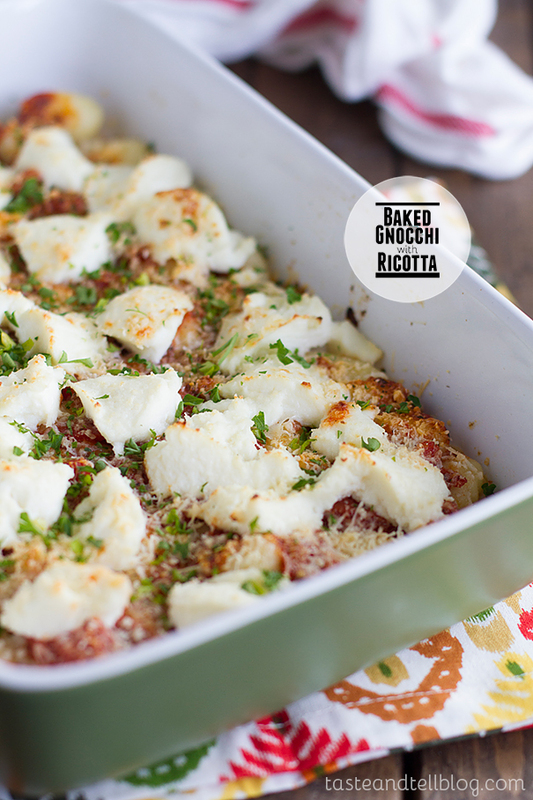 If I had a big bowl of your baked gnocchi, I would be a happy girl! I love the addition of Ricotta-it’s such a delicious and versatile cheese! This looks divine. I could go for a batch of that right now. I try to cook from my cookbooks every week, but I feel like I just keep going to the same five favorites. I really should explore more of them! 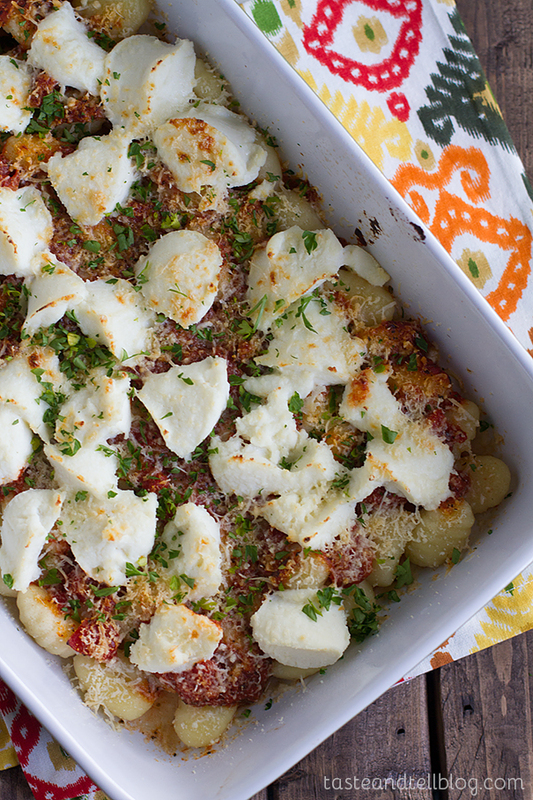 This baked gnocchi sounds SO good…such a comfort food. I’m the same way with cookbooks! I always ask for them as gifts and people think I’m crazy. 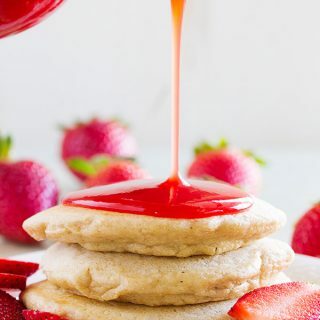 This is recipe looks so simple and so tasty. 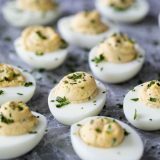 Love this simple, easy meal! Reading through cookbooks is one of my favorite past times. Looks delicious! 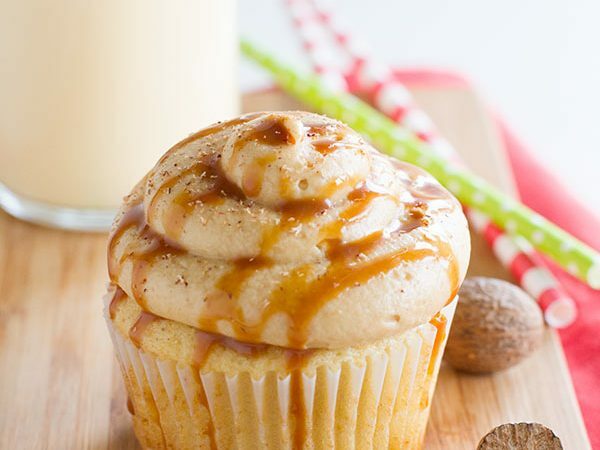 Oh yum, this looks simply delicious! I bet this would be really good with some rings of hot Italian sausage mixed in.